Now that the new year is upon us, are you considering making some updates to your home? If so, you might be a little overwhelmed thinking of all the things you could do—and how to best stay on budget to get it all done. At Treasure Coast Window Fashions serving West Palm Beach, we’ll be happy to share some tips to help you achieve success. Whether you have a small single room to update or you want to makeover your entire home, staying within a budget can be a challenge. Start by making a list of everything you want to accomplish. Once your list is complete, set it aside. Then start looking at how much you can spend. Setting up a reasonable budget will allow you to enjoy the decorating process. Next, review your list to determine which changes you can reasonably make. Remember that, when it comes to achieving your decorating goals, even a small change can have a big impact and freshen your room without breaking your budget. For example, if you’re looking to add color to your room, you might be able to make that come to life with just a few new decorative throw pillows. 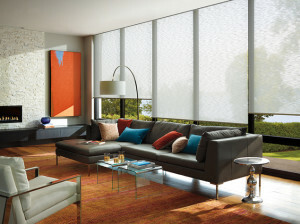 Soft Sheer Custom Treatments – For soft window treatments with a modern flair, check out the collection from Hunter Douglas. These beautiful, sheer horizontal shades provide a modern look by combining the functionality of a blind with the beauty of a fabric shade. 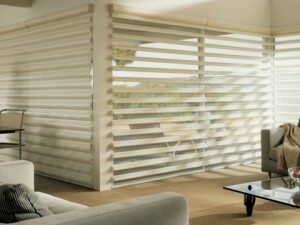 Collections to look at include Silhouette® Window Shadings, Pirouette® Window Shadings, or Nantucket™ Window Shadings. Custom Shutter Collection – If your dream design includes elegance, European flair, or cozy country comfort, consider plantation shutters from Hunter Douglas. You could choose from Heritance® hardwood shutters, NewStyle® hybrid shutters, and Palm Beach™ Polysatin™ shutters.